If you actively connect with business partners and customers online, chances are you understand the importance of your virtual paper trail. You emails contain client data, ideas, instructions and other information critical to your business success. Loss of such data could disrupt your relationships, cost you money and even get you into legal trouble. A good email backup strategy is the best way to ensure you never get into that kind of situation. In this guide, we’ll walk you through the basic steps of backing up your email data files in the cloud. We’ll use three of the best online backups solutions for email to help explain the process: Carbonite, Backblaze and CrashPlan. Backing up your email to the cloud requires that you are using a desktop client to access your emails. As most people are familiar with it, we’ll use Microsoft Outlook as an example. However, these step outlined in this article work similarly with other popular services like Windows Live Mail, Mozilla Thunderbird, Incredimail and Mac Mail. Email clients like Outlook 2016 store all your emails in a single data file. For Windows Outlook users, this will be a personal storage table (PST) file. For Mac Outlook users, it will be an Outlook for Mac (OLM) file. The first thing you need to do in order to backup your Outlook emails on the cloud is figure out exactly where that file is. If you’re having trouble locating your email data file, you can easily discover its location from inside the Outlook app. In Outlook 2016, first click “file” in your toolbar. The account settings window will open. Click on the “data files” tab. This will list the location of your email data file. Now that you know the location, you’ll need to make sure your data file is marked for backup by your online backup service. Some services make this easier than others. With Crashplan, you’ll need to open the desktop client first. Make sure you’re on the backup tab and click the “change” button under the “files” section. Navigate to the location of your email data file and make sure the radio button beside it is checked. Going forward, this file will be backed up by CrashPlan. Carbonite makes the process even easier, because it doesn’t require that users mark files for backup from within its client (it’s not even possible). Instead, just navigate to the location of your email data file using file explorer. That’s all there is to it. In fact, Carbonite simplifies the process even more if you opt for automatic backup when you install its app to your computer. Carbonite will locate and tag common file types for backup on its own, including email data files. That way you don’t have to go hunting for them. However, with Carbonite, automatic backup only works if the files are under 4GB. If you have a large email data file, you’ll still need to manually tag it. Backblaze automatically selects files for backup based on file type, too. From Backblaze’s desktop interface, you just need to make sure your email data file type isn’t in the file-type exclusions list. To review the exclusions list, click settings. Then navigate to the exclusions tab of the settings pane when it opens. Check below the words, “these file types will not be backed up” to make sure .pst/.olm aren’t listed there. By default, it shouldn’t be. Backblaze doesn’t let you select or deselect individual files for backup from your file explorer, however. With most online backup services, you can either elect to schedule backups or let them run continuously. The backup process can hog system resources and scheduled backups are one way of making sure your system won’t lock up while you’re working. The issue with scheduled backups is that it means your business emails won’t be backed up as frequently. So, if your computer crashes, you’ll lose any emails sent or received in between backups. That means for business users who place a high priority on records of their communications, continuous backup is the better choice. Most online backup providers let you switch turn continuous backup on from within the desktop client. With Carbonite, for example, you only need to open the service’s desktop tool. Then, click on “settings and controls” to visit the settings pane. Make sure “backup continuously” is checked and you’ll be all set. Carbonite enables this feature by default, so it should already be on, anyway. Backblaze and CrashPlan are just as easy to configure. With Backblaze just click settings and go to the schedule tab. Select “continuously” from the backup schedule window. Once you’ve got continuous backup set, however, don’t make the mistake of thinking your emails are backed up in real time as you type them. While a mostly a great backup service, Backblaze isn’t able to backup PST files while Outlook is open because its file transfer algorithms can’t work around locked files. Carbonite and Crashplan don’t share that limitation. That’s because they both use volume shadow copy service (VSS), a Microsoft technology that allows for backups of files even when they’re in use. Another Backblaze limitation impacting email backup is that any data files larger than 30MB are only backed up once every 48 hours, regardless of whether you have continuous backup on or not. Since Outlook PST files are set to grow up to 50GB in size by default, this is likely an issue you’ll face if you send many emails. Carbonite, meanwhile, backs up files within ten minutes of a change occurring and doesn’t pay attention to file size. (Note: subsequent changes to files are backed up within 24 hours). When it comes to backup speed, all three services handle large files well thanks to block-level incremental processing. Block-level incremental transfers means that when your email data files change, the entire file is not uploaded again to your cloud backup space. Instead, only the parts — or blocks — of the file that changed are copied. This saves time and reduces the toll on your system resources. If email communications are critical to your business, it pays to make sure a hard-drive crash, file corruption or stolen laptop don’t leave you disconnected from your coworkers and clients. Thankfully, the right online backup solution makes it simple to safeguard your data. All three online backup services used as examples in this piece make it easy to locate and mark your email data files for backup, and they use powerful file transfer architecture to ensure a smooth process. All three also offer unlimited storage and both home or office plans. We at Cloudwards.net feel confident recommending any of them, but feel that Carbonite offers the best all-round service for people looking to backup business email. 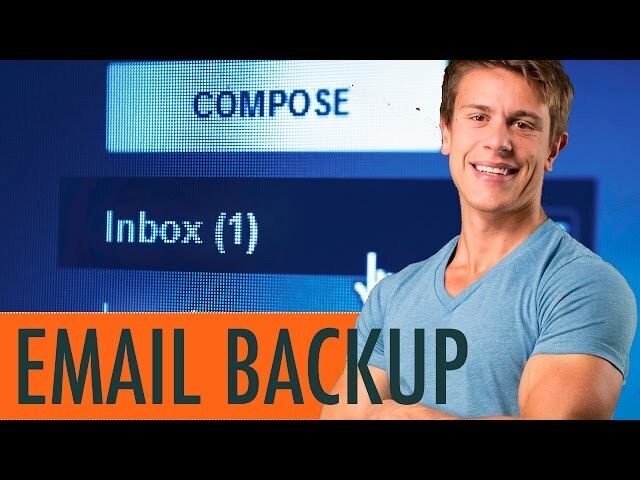 Questions or comments on backing up your business email? Hit us up in the comments below. Don’t be fooled by the Backblaze setting “Back up continuously”. Like the article says, if your email files are over 50MB they will NOT be backed up “continuously” (only once EVERY OTHER DAY). This is a huge limitation of Backblaze in my opinion. Backblaze vs Carbonite: Who Has The Better Service in 2019?